0 Comments Published by Cedric Benetti on Monday, September 29, 2008 at 9/29/2008 01:07:00 PM. 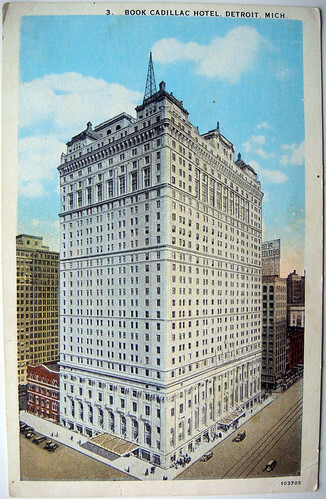 This is the Book Cadillac Hotel in downtown Detroit, once Detroit's tallest building, and the tallest hotel in world, when it opened in 1924. It is nearing the end of a 180-million dollar renovation slated for completion in October 2008 after having been vacant for over 20 years. One of my US-emigrated relatives, my great-great grand uncle Pierre Haag, adventurer in his spirit during the heydays of the roaring twenties worked there as a cook. He traveled along the US and worked in numerous cities and on transatlantic steamers. The Postcard here was sent back to his Luxembourg relatives. Just take a look at this building, maybe you find one alike in the Grosstrasse in Luxembourg. This is only a small one (hotel). I worked in one in New York. 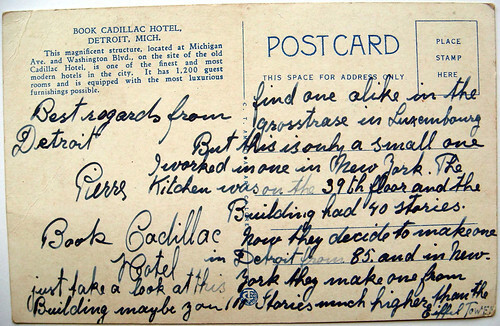 The kitchen was in the 39th floor and the building had 40 stories. Now they decide to make one in Detroit from 85 (stories). And in New York they make one from 100 stories much higher than the Eiffel Tower."